Taj Tashi Bhutan Thimphu - Hotel videos, user reviews, cheap booking! Five-star luxury awaits at Taj Tashi Bhutan, set in the heart of Bhutan’s Thimphu Valley. 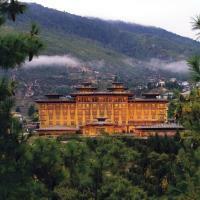 Featuring elaborate Bhutanese architecture, the hotel offers a fitness centre and luxurious spa. 4 dining options are provided in the hotel. Taj Tashi Bhutan is 7 km from Buddha Point Thimphu. Paro International Airport is 60 km or an approximate 1-hour drive from the hotel. Stylish rooms feature wooden décor, with select ones providing stunning views of Thimphu Valley. A flat-screen TV, minibar and tea/coffee-making facilities are provided. Suites offer walk-in closets and luxurious bathrooms with a standalone bathtub. Guests can unwind in The Jiva Spa, featuring a spa menu of Indian healing therapies. A concierge desk and business centre are available to assist guests. Currency exchange and ticketing services are offered for convenience. Chig-ja-gye and The Thongsel specialise in Bhutanese cuisine, while drinks are featured in Ara and Rimps. Room service is also available.